The adrenals and kidneys are spiritually dynamic. Learn the different impact of the two, and how they affect the spirituality of your heart and brain. This is a seven CD set. The concept of the heart as a spiritual organ is quite well established in Western theology. The Bible, however, includes the adrenals and kidneys as playing a strategic role in the spiritual climate of a person. The kidneys think and the thoughts of the adrenals and kidneys are so significant that God specifically judges them for how righteously or unrighteously they think. Their contribution to the spiritual condition of the spirit and body is immense. They are also the seat of a wide range of emotions, from fear to sorrow to joy. And those emotions seem to be more spiritual than merely soulish. This album explores the fractal of two through the grid of the adrenals and kidneys, then presents a significant series of blessings for them. So far, we have not found any portion of the body that is as spiritually responsive as the adrenals and kidneys. The speed with which the body goes into detox when they are addressed is remarkable. And when the detox is over, the breadth of positive results in the body is also remarkable. After recovery from an accident had stalled out, and was very incomplete, I ordered the teaching. The short version is: dramatic, sustained improvement. I really like to know the root of issues, and deal with the issue and the root; my mindset is to deal with it so completely that it can never come back. And if it even tries, I will recognize what it is and deal with it effectively. Long before the accident, I had been in prayer about my lack of joy. All the standard prayers, scriptures, declarations did not seem to be making a dent. I added joy oils, joy candles, communion, prayers by others, still not a lot of change. The accident happened, then surgery, medications, therapy, but worst of all was unrelenting, agonizing pain. I found a great prayer counselor who got me stabilized enough to be able to listen to teachings; it was almost impossible to read because of the a medication side effect. Weeks of pain went on, I found Arthur’s teachings, and in the short bursts of awake time, I listened and learned. “Baby Blessings: Joy” was an excellent jumping in point. Several free teachings helped, then finally made it to “Fractal of Two: Adrenals & Kidneys” and wow. So the first CD warnings didn’t scare me, was already in a lot of pain. And the first day I only listened to one blessing, as suggested. But, the second day, after hearing the next one, I was ready for more. So listened on to several more, paused and evaluated…. Not feeling worse, so I went on and actually completed the entire series the next day. At this point I was feeling much better. When I started listening, I was still sleeping more hours a day than I was awake. And having these terrible flashbacks that would overwhelm me, causing bouts of horrible tears and panic. I had no idea of what was really going on, and never seemed to be able to adequately explain it to anyone in order to get help. It was very hard to think, focus and my memory was impaired. But listening to the CDs explained to me what was happening, how to deal with it, and change came for the better. I now know the accident wasn’t the initial trigger of all this stuff with my adrenals and kidneys. Looking back, I can see the years of groundwork laid down so that by the time the accident happened, I was set up for destruction. But God is good, kind, and merciful to me. My healing journey is still in process, but I am continuing to help myself by keeping this teaching, along with “Baby Blessings: Joy” on a replay loop in my bedroom 24/7. If you are feeling drawn to this teaching, but feel there is nothing wrong with your adrenals and kidneys, like I did, and so you think you should not order it, please reconsider. I could have saved myself months of agony, had I just ordered and listened the first time I saw it and felt a pull. This entire series is excellent. One aspect that stood out is the connection of the kidneys and covenants. Knowing this connection between covenant and kidneys was vital information when a couple of years later I went through some major healing of annulling generational occult covenants. The Lord knew what I needed and I had the information for the right time. This is just one of the many treasures offered in this series. This set touches the body, soul, and spirit with healing and change at it's core. Personally, this was an answer to many prayers and an amazing gift from the Holy Spirit. I've struggled with adrenal issues all my life. From the first lesson, I could feel my spirit leap with excitement for the truth God was about to reveal to me. I had some discomfort over my kidneys after every lesson for 3 weeks or so along with some extra tiredness. I felt a major shift as soon as I started using the prayer at night over my kidneys and adrenals. During the first week I started reciting the prayer, I was awakened every night at 2:32 or 3:22 which I believed was a message from God. I asked the Holy Spirit to shed some light on the #7 and I was lead to the creation story. On Day 7, it was finished, complete! It was all good! God rested in a job well done. I have a peace like never before and have discontinued an adrenal supplement I have taken for the last 20 years. I still recite the prayer every night and will repeat the series again and again for deeper healing and release. This is a must in ever person's arsenal of "freedom weapons" to be used over and over again. Thank you Arthur and Team for your passionate obedience! Just like some of the other comments already made, I didn't realize at first why I was drawn to the Fractal of Two: Adrenals & Kidneys. I ordered the CDs and started listening to CD 1 as soon as the order arrived. I listened to the first CD over and over for a week before I began CD 2. My normal preference is to replay teachings that the Lord is breathing on because I want to savor every word He is imparting to me. I listened to one blessing a day (it is hard to listen to only one!) because of the warning about the health issues experienced by the beta test group. At the end of the week I thought it would be a good idea to review the first 5 blessings—I thought there shouldn’t be a problem with listening to more than one since I had already listened to them once. I got a cold! I literally haven’t had a cold in years but I thought, this is a coincidence—I must have picked up something from my infant granddaughter, so the next week I picked up again with the remaining blessings (one a day) for the remainder of the CD. And again at the end of the week I went back, this time listening to all of CD 2 in my normal preference of reviewing to glean all the Lord is speaking to me. I got a sinus infection, lost my voice for a week, ended up with antibiotics and lots of over-the-counter meds, missed 3 days of work, and my left ear is not fully functioning two weeks later! So for the past 2 weeks I’ve been asking the Lord what in the world is going on. Here’s what He’s brought to mind so far: 2 men in my family died from renal cancer—my father (whose parents divorced when he was a child during the early 1930’s) and uncle (my mother’s brother, who also had covenant issues during his life). This means I have a double whammy—covenant issues on both sides of my family bloodline. I am spending much time in prayer, repenting, receiving and giving forgiveness, meditating and declaring the Lord’s provision of healing and restoration. So many things are beginning to add up that I had not connected before, and I am only on CD 3! I highly recommend this series for cleansing body, soul, and spirit! I realize now how much I needed it and I marvel at the intensity of the detox so far. The Lord is revealing mysteries along the way, and I expect to continue to be amazed as I continue listening to the next 4 CDs. I am on day 30 of an overall body cleanse / fast and on day 10 of Arthur Burk’s Fractal of Two: Adrenals and Kidneys download. I had felt like my body cleanse was missing a spiritual component and Arthur Burk’s audio album is exactly what I was looking for. Arthur looks at our adrenals and kidneys from a spiritual viewpoint and crafts daily blessings from God’s word to encourage our spirits to engage with God’s spirit to bring our Adrenals and Kidneys into proper alignment and health. I would recommend this audio series to anyone who wants to have a healthier body and live a more abundant life. My wife and I are currently in process with Fractal of Two. Now, here is what I know so far. This is a series of both teachings on a good and solid cross-section of what Scripture has to say on the subject of covenants, our design, joy, other emotions, certain other dynamics of our life with the L-rd, and the various and numerous roles that the kidneys and adrenals play. One thing that clearly came out in this teaching was the focus that G-d puts on the kidneys in the sacrificial system of the Old Testament. This was on Disc 2. I was blown away. Then, the series of cuts on Disc 2 dealt with a number of the dynamics of "qanah" (the Hebrew word for "purchase") and how that word relates to the kidneys and adrenals, which appear to have a huge role in covenants and their outplay and establishment. The other dynamic I noticed is that as you work with these organs, they respond readily. Think of what kidneys do, and think of what adrenals do, and take note of the warning that they will respond. Nearly halfway through this series, my kidneys are hurting and I am experiencing the effects of the dumping out of the toxins that the kidneys filter. I am noticing a change in my health, yes, some of which carries some risk, but I am also noticing that my kidneys are more responsive to spiritual things. This is one of the steeper Sapphire teachings that comes with a warning for wise reasons: working with your reins (what the KJV calls the kidneys and adrenals) is not with out its share of risks, but there is also a good dynamic reward that is worth the pain that is embraced. Bite off one piece at a time. Be gentle with yourself as you listen. And spend time chewing on the context for each of these scriptures that the set covers. As a result of some personal challenges that Arthur makes on a semi-regular basis to provoke the Tribe to stretch beyond what he does, I ad-libbed my own renunciation/blessing/warfare/deliverance/CLEANSING on-the-fly and WOW, did it take! Remember, gang, buy this, give it a thorough listen, and then use it as a jumping-off point to develop your own material to uniquely bless after your own design. Remember that development of the art of blessing that Arthur mentions constantly? This album is part of that, and the bonus is that you get to detox yourself spiritually and physically. Be blessed, as always, in the fullness of Him who presents you faultness with overabundance of joy. Cannot recommend enough! The understanding brought forth in this series is dynamic to shifting ones life into vitality especially if currently struggling physically or emotionally. My kidneys and adrenals were not handing the basic load of life and were stuck which was creating major health challenges. The blessings are giving my spirit and my kidneys/adrenals a framework to move past the issues, process them and see My God again in His proper context and perspective. This is creating a shift in my health and life that is desperately needed. So worth the purchase! Amazing! This was one of the first albums I heard from SLG, not even knowing why I was drawn to it, especially because the title didn’t seem “spiritual.” As I started listening to it, let’s just say, to put it mildly, I was shocked. Like, almost literally. I’ve believed in the authenticity and holistic connection between the spirit, soul, and body for a long time, but this teaching took it to a new level, and down to much deeper depths. As they say, “The proof is in the pudding,” and I had profound experiences when listening to this – emotionally, physically, spiritually. It’s cleansing and freeing, and somehow establishing, or reestablishing things to how God intends it to be in our overall living “climate,” our perceptions and responses, our connection to Him in the daytime and the nighttime, how we get instructed from the Lord and make decisions based on that, and more. What happens when listening to this is beyond words, because it somehow reaches into the depths, our “inner being” of the “heart,” which is really what we call the adrenals and kidneys, a most important part. This teaching is totally unique, awesome, and profoundly impacting. Thank you, Arthur. This is some of the most "out of the box" and fascinating teaching I have heard from Arthur and though it was helpful regarding the aspect of the health of my kidneys and adrenals, the very concept of "framing life" through the lense of covenant is something that has affected EVERY area of my life. It has literally refocused me on the Truth and I cannot recommend it more highly. The fruit in my health and relationships is tangible. I actually went through the entire series, one a day and noticed I could feel my left kidney and adrenals physcially throughout the 40 days. Once I finished the series, I started again but this time listening to at least 3 a day (even though there was the warning to only do 1 a day) - after 4 days of this I had a checkup with my naturopath and the results of all the usual tests showed my kidneys and adrenal were very very stressed meaning I was detoxing at a rate too fast for my body. The blessings were so powerful that my body could not process the detoxification that was happening as a result. I have since returned to normal but my general health has improved greatly. "I"m so grateful for your teachings and for making this kind of ministry available. I've turned on several people to your teachings. You'd laugh... whenever my right or left kidneys are 'twitching'... I remember the Fractal of Two.... and identify whether or not I'm framing what the problem is, or how to deal with the problem.... whenever I see land or places that are disorganized or full of trash, I want to go and cleanse the land from defilement.... I sense sound portals... I see defiled time.... I know so much more from having sat at the Apostle's feet! 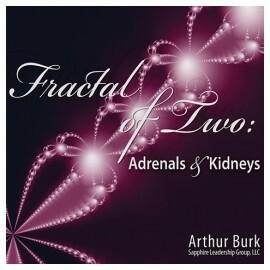 The Fractal of Two: Adrenals & Kidneys, was the very first teaching I ever listened to that I picked off a friend's shelf amongst many others by Arthur Burke, whom I had never heard of! I was intrigued by the title, partly because it wasn't a typical 'ministry' or 'religious' title! I didn't have any issues with adrenals or kidneys physically, but the first sentence on the back of the album says, " What do your adrenals and kidneys do in the spiritual realm?" The second line was no less surprising: "According to the Word of God they think and emote." That was it. I had to find out more. I went through the teaching, all seven CD's in about one week, which isn't advised, due to the depth of which the deliverance, cleansing, and blessings can cause discomfort in all sorts of ways. I did have some severe reactions, but because I was warned and knew what was causing them in the de-toxifying I wasn't alarmed! Now, after all these years, it's like having something that was affecting you, that you didn't even know about or understand, NEVER bother you again, so it's hard to remember what it was like before! The MAIN thing that has stood with me is that whenever I feel one of my kidneys paining or 'twitching' as I put it, I immediately stop and determine what the implications are if it's the left one or the right one. Sure enough, each time I'm either dealing with issues and haven't defined the real problem, or I am dealing with a well defined problem and struggling to identify options or a solution. I always remember the story of the lady Arthur talks about who went into the doctor's office with kidney pain. When she had 'framed' the problem and a solution as she was explaining things to her doctor, her discomfort went away and she was fine! The BEST part of this teaching, is the break down of the various areas in which we are affected and one by one Arthur takes the listener through a Biblical foundational truth, scientific or researched information, and ends with recognition of areas for confession, warfare, and blessing. I have slept better ever since and been grateful that God in the night watches is communicating with my body, soul and spirit through my adrenals and kidneys! For someone with chronic issues with my adrenals this has been quite insightful and is changing my life, probably more than I realize. Psalm 16:7 is translated "heart" but God really truly said "kidneys." So what's up with theologians editing God's medical advice to us? Beats me. But I did an end run around them, and you can listen to it here.